The Canadian lynx has very complex needs for its habitat. The Canadian lynx lives in the very cold remote northern forests of North America. More specifically, Maine, Minnesota, Montana, Wyoming, Idaho, Washington, and Colorado. The Canadian lynx will either live in young forests with thick vegetation or in old forests with good cover for their den. One bad part about their habitat is that they share it with a few of their worst predators, the bobcat and coyote. The Canadian lynx stays in deep snow so they can avoid those predators. 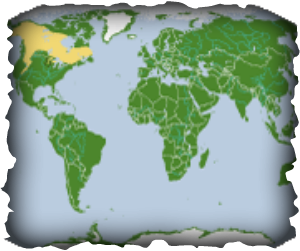 The yellow on this map shows where the Canadian lynx lives.